This is another great big hit for the x-men franchise, they have done it again with this TV program Evolution! This show aired on television from the year two thousand to two thousand three, they had a really good run! The fans from all around the world love x-men and are glad to see them back in action again. With a cast of all of your favorite characters that you can remember, starring Rogue, Jean Grey, Cyclops and spike as the greatest fighting force that the world has ever seen! 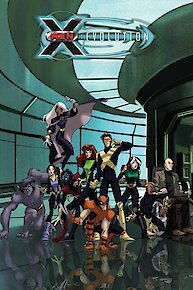 Therefore this series of x-men are for the fans, Evolution starts with the team as they are teens growing up. Too discover that they have to learn how to fight for a world that does not fully understand them yet. And the team runs into confusion as they yearn to figure out why this is happening to them. As the world finds out that they are mutants and that comes with a lot of hate towards the team. So the team fights for the world anyway besides the worlds belief system. Also the professor is back Charles Francis Xavier that has his mutant ability to read other peoples minds. Wouldn't that be cool, What professor Xavier likes to do is try to find new mutants and try to show them how to use there new powers. There are a lot of these mutants out there to, He also has built a school for the gifted youngsters and this is there school! The students there just love that fact about there school being theirs. And they have a lot of homework to do also with training, the moves that the super heroes must learn to use in there fights with the villains. However there are four seasons so this series had a really nice run on the tv, And also the production team has earned themselves a motion picture sound editor nomination and even more awards the director did a good job. The X-men, Brotherhood, and Acolytes only have a short amount of time till Apocalypse completes his master plan. Wolverine, Nightcrawler, and Cyclops find themselves in a battle with Mystique, the mutant that is guarding Apocalypse. Can they get through in time to stop Apocalypse? Meanwhile the other mutants face off against their former allies, can they hold their own while Wolverine's team takes out Apocalypse? When Kitty is saved by a girl who just disappeared, she learned that it was just a dream. But who is this Danielle? Gambit needs help rescuing his father, so he tricks Rouge into going to New Orleans with him. Professor X's past comes back to haunt him as the son he never knew he had is discovered. What does David want with the Professor, and can the X-Men handle the powers of this new mutant? Wolverine faces X23 once again, and X23 isn't too happy about it. She wanted to get over her past, but looks like that won't happen now. Can Wolverine protect X23 from falling into Hydra's hands? The Brotherhood has supposedly turned over a new leaf, and has begun to fight crime. However, how long until their true colors begin to show? Magneto decides to take a stand against Apocalypse, even though the X-men don't want him to. Is Magneto powerful enough to handle Apocalypse though? And Rogue will have to face one of the hardest decisions of her life. Evolution will never be the same again! Some of the various members of the X-men team take a cruise to get away from all of the mutant propaganda that has been plaguing them lately. However, the X-men have to expose their secrets to save a small village from getting destroyed by a volcano. While trapped in a pyramid, that was supposed to be Apocalypse's resting place, Professor X learns the history of Apocalypse. However, it turns out that the X-men and the Acyoltes went to the wrong place, leaving Wolverine, Sabertooth, and Gambit to fight Rouge, Mystique, and Mesmero in order to keep them from freeing Apocalypse... But will they succeed? Mesmero takes control of Rouge's mind and has her steal the powers of all the X-men, the Brotherhood, and the Acolytes. Then, Mesmero, Mystique, and Rouge head for Tibet, to unlock the final door that is keeping Apocalypse from breaking free. Now, the X-men and the Acolytes must fight side-by-side in order to take down the coming threat of Apocalypse. A new Weapon X has been created using his genetic code. Her name is X23, and she arrives at the Institute in search for a fight against Wolverine. When the second key to unlock Apocalypse is found, the X-men find themselves in a battle against the Acolytes. The X-men want to protect it, while the Acolytes want to destroy the key. But what happens when the key is destroyed? All the personalities Rouge had consumed over the years begin taking over, and she becomes a danger to everybody, so it's up to the X-men to save her. As Wanda continues the search for her father, Toad goes to extremes to try and get her to fall in love with him. Spyke's mutation is becoming harder to control, as well as his temper. He finally finds solace and acceptance in a most unlikely place -- but at what cost? Mystique ends up breaking out of Area 51. After her escape, she goes after Cyclops, the man that caused her to be in the hands of the United States army. Can Cyclops survive Mystique's attack on him? Juggernaut goes on a rampage and the X-Men still have no clue where to find their leader. Can they defeat Juggernaut without the psychic blasts of Charles? X-Men Evolution is currently available to watch and stream on The WB. You can also buy, rent X-Men Evolution on demand at Amazon, Vudu, Google Play, iTunes online.